A3967 Stepper Motor Driver For Arduino is the latest version of EasyDriver v4.4. It provides greater flexibility and control over your stepper motor compared to the older versions. 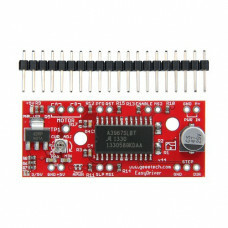 It is a simple to use stepper motor driver, compatible with most microcontrollers that can output a digital 0 to 5V pulse (0 to 3.3V pulse if you solder SJ2 closed on the EasyDriver). The module requires a 7V to the 30V power supply for a motor. The module has an onboard voltage regulator for the digital interface that can be set to 5V or 3.3V. Connect a 4-wire stepper motor and a microcontroller and you’ve got precision motor control! EasyDriver drives bi-polar motors and motors wired as bi-polar. i.e. 4, 6 or 8 wire stepper motors. The microstep select (MS1 and MS2) pins of the A3967 are broken out allowing adjustments to the micro-stepping resolution. The sleep and enable pins are also broken out for further control. The A3967 is a complete microstepping motor driver with builtin translator. It is designed to operate bipolar stepper motors in full-, half-, quarter-, and eighth-step modes, with output drive capability of 30 V and ±750 mA. The A3967 includes a fixed off-time current regulator that has the ability to operate in slow, fast, or mixed current-decay modes. This current-decay control scheme results in reduced audible motor noise, increased step accuracy, and reduced power dissipation. The translator is the key to the easy implementation of the A3967. By simply inputting one pulse on the STEP input the motor will take one step (full, half, quarter, or eighth depending on two logic inputs). There are no phase-sequence tables, highfrequency control lines, or complex interfaces to program. The A3967 interface is an ideal fit for applications where a complex μP is unavailable or over-burdened. Internal circuit protection includes thermal shutdown with hysteresis, under-voltage lockout (UVLO) and crossovercurrent protection. Special power-up sequencing is not required. The A3967 is supplied in a 24-pin SOIC, which is lead (Pb) free with 100% matte tin leadframe plating. Four pins are fused internally for enhanced thermal dissipation. The pins are at ground potential and need no insulation. Compatible with 4, 6, and 8 wire bipolar stepper motors such as popular NEMA 17. Compatible with Arduino GRBL G-code interpreter for driving 3-axis CNC machines.